OTTAWA, Ontario, April 24, 2017 – Choosing GaN instead of legacy silicon transistors allows power systems designers to increase both system efficiency and power density while reducing system size, weight and cost. Nowhere is this trend more apparent than in the energy market where GaN transistors are replacing MOSFETs in applications such as Energy Storage Systems, inverters and AC solar panels. To inspire power design engineers at Chinese universities to advance electronic power technology, GaN Systems is again sponsoring the annual CPSS design competition. The China Power Supply Society (CPSS), the China Power Society Science Popularization Committee, and the Nanjing University of Aeronautics and Astronautics are conducting a competition to design high efficiency, high power density, GaN-based inverters. The theme of the 3rd annual competition is the application of power electronics technology for innovation, energy saving and new energy use. Inverter design entries will be evaluated based on performance criteria, including inverter efficiency, power density, and output stability across various load conditions. The CPSS will announce the finalist teams on September 15, and the competition winners will be announced and presented their awards at the November 22 annual meeting. Cash awards of 20,000 yuan, 10,000 yuan, and 5,000 yuan will be given to the first, second and third place winners, respectively. 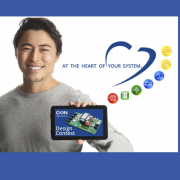 Jim Witham, CEO of GaN Systems, commented on why the company strongly supports design contests, “GaN Systems believes that design contests like the CPSS competition serve to motivate and excite power system designers to design and build systems with efficiencies and power densities never achieved before. The industry saw this firsthand with the Google Little Box Challenge where GaN-based inverter power densities dramatically exceeded the challenge goals. We are proud to provide opportunities for engineers to explore and expand the performance limits of power inverters by leveraging the benefits of GaN transistors in novel inverter designs.